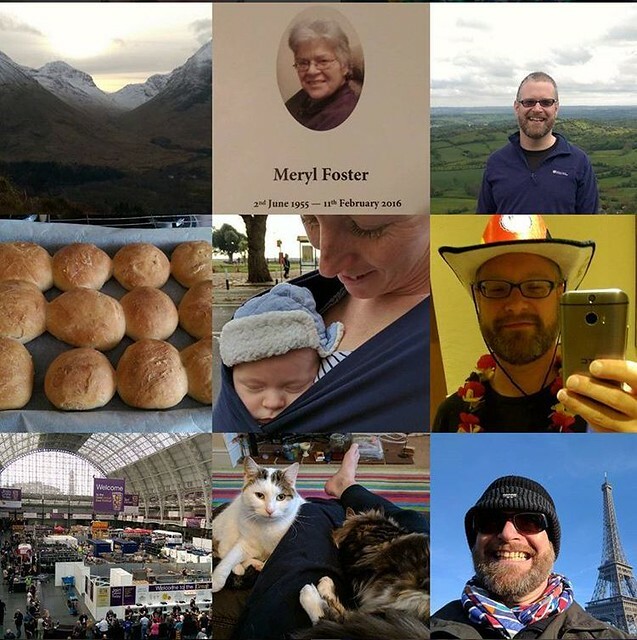 A departure in format this year – I saw the instagram hashtag #2016bestnine and mulled it over in my head for a few weeks before trying to put one together. Whilst thinking about it, I completely forgot what the hashtag had been and lost examples, and in my muddled thinking it turned into a set of nine images that reflected the year rather than in any sense were the best parts of it, or the best images I made. I changed phones midway through the year which meant getting all the images into one place was a pain. And the idea of doing this sort of editing and processing on my phone rather than my computer was certainly novel and a sign of the times. Nine things from 2016 – Hogmanay in a youth hostel in the Highlands. My mum died in February. RIP. I’ve got out a lot more and walked more in the Peak District. I’ve been baking a lot more and have been playing with sourdough. My amazing sister in law produced another nephew. I was in Germany during the world cup on a school trip. In August, I worked behind the bar at the Great British Beer Festival in London. Fudge and Steve the cats continue to bring great joy. December took me to Paris with school for the first time in a few years. Next year – New year in Scotland again; Norwich in May, Lincoln and Madeira in August – see you there!